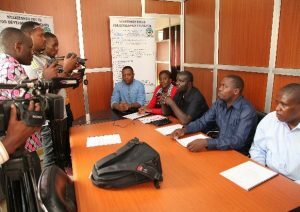 Nyakitonto Youth for Development Tanzania (NYDT) have launched their EAC Youth Agribusiness App. 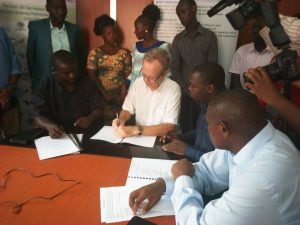 After Local Climate Investment (LIC) representatives and NYDT have signed an MoU on how to strengthen communication between farmers and cross-border crop traders in East Africa, the way was paved for the app. On the 7th November 2018 on LIC office premises with vibrant media witnessing it, the two partners reached on this decision following the need for them to collaborate in developing and implementation of a workable model for Youth Agribusiness App in Kigoma. organization from priotized villages in Kigoma to Utilize and benefit from district One Stop business centres funded by LIC in each councils in Kigoma, development of business database and farmers database, production of database and digitalize them through Agribusiness App, Website and Nyakitonto Youth Online TV, LIC website, Council Website and other social media; and development, updating business information on Youth EAC Agribusiness App for digital Marketing in the EAC countries. Nyakitonto Youth for Development Tanzania was represented by Theonest C Tereba for the Director and Ramadhan Joel Nkembanyi the Programme Manager for EAC Youth Agribusiness App whereas LIC was represented by Dr. Flemming Winther Olsen and Peter Elias (Policy Expert). In his statement, Dr. Olsen explained that the creation of economic viable and financial investment in Kigoma requires information as a crucial tool for sustainability of projects. Information is an imperative tool towards achievement of all investments required for community transformation. Theonest C. Tereba explained that “With the use of Agribusiness App, youths who comprise a great percentage of the total population in East Africa, will use their mobile phones to communicate the EAC Common Market Protocol on non-tariff barriers, also with this e-platform, farmers will communicate on the availability of produces, type and quantity of produces, place and price with photograph attached”. The Application targets young people in East Africa-Youth who live in villages and town are farmers, buyers, or general traders in agricultural products. It links crops sellers and buyers who trade in East Africa. Crops sellers are able to upload their products along with all the pertaining features of products (unit, stock, location, price, internal and external contacts). Likewise buyers are able to communicate their demands and view all sellers. Further, they both have a way to interact on a trending forum of conversation, viewing market demands, benefiting from the trading guidelines that dictates the internal and cross-border trading on different authorities, view market information on various markets around East Africa. Many of the trading partners from both Burundi and Tanzania (and perhaps from other partner countries) are less knowledgeable on the EAC Common Market protocol. Their lack of knowledge on non – tariff barriers and others of similar nature fueled the gear towards NYDT move to thinking of creating this user-friendly App. We encourage youth who wish to do agriproduction to join and subscribe to the EAC Youth Agribusiness App, find it in the playstore.